Join us for our many programs! Click here to subscribe to our calendar ics feed. Jennifer Lawson, MD, is Clinical Associate in the Duke Department of Pediatrics. 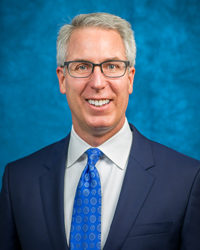 Please join us for a candid conversation over coffee and snacks with Dr. John Hardin, Executive Director of the N.C. Office of Science, Technology, and Innovation. We will be discussing the work how science and technology policy is developed at the state level, how state policy builds on federal policy, and how science and technology are drivers for economic development across the NC. Join SciPol for Science Policy Happy Hour at Motorco in Durham! We host Happy Hours prior to each Periodic Tables: Durham’s Science Cafe event! Science Policy Happy Hours are for individuals interested or already engaged in science policy. They are informal networking and engagement opportunities for professionals, students, academics, and enthusiasts—at all career levels—who share an interest in science policy and communication. Come have a drink and grow your science policy network! Please contact Andrew Pericak with your questions. View our Facebook event page and friend SciPol to stay up to date on all things Science Policy. This event is sponsored in partnership with The Engaging Scientists & Engineers in Policy (ESEP) Coalition. Coal Ash. Lead. Aging Infrastructure. Every drink of water is a risk: Where did it come from? How did it get there? What chemicals or microbes are in it? Who processed it and how well? Come listen to an interdisciplinary group of Duke University students showcase their creative projects, sharing insights they learned from communities and stakeholders across the state about the kinds of risks they encounter in their drinking water. 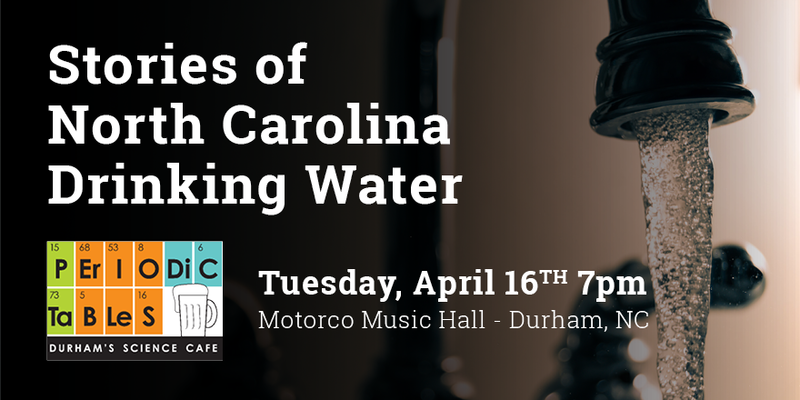 This Periodic Tables presentation focuses on three different case studies that explore water and risk in North Carolina: lead contamination in Durham, coal ash impoundments in Belmont, and aging infrastructure in Orange County. Collectively, these case studies make visible the structural risks built into our politics, laws, and infrastructure. Join us for an evening of discussion on local drinking water and the complex factors impacting its quality. In partnership with Duke’s DECIPHER team. Admission is $5. All ticket sales go toward supporting the program. Attendees may secure advanced tickets to guarantee seating for the event; preferred seating will be reserved. Please complete this combined RSVP for the keynote lunches and receptions, noting any special dietary considerations. Dr. Jessica Dale Tenenbaum is a faculty member in the Division of Translational Biomedical Informatics in the Department of Biostatistics and Bioinformatics. “Science in the Movies” explores how science is portrayed in popular cinema. Our April event will focus on Natural Disaster movies. Whether it’s earthquakes, tidal waves, twisters, meteors or sharknadoes, natural disasters have always been popular fodder for Hollywood filmmakers. Join our panel of experts, including: Elizabeth Gardner (WRAL Meteorologist), Dr. Marsha Gordon (NCSU Film Scholar and host of WUNC’s “Movies on the Radio”) and Dr. Jessica Whitehead (climate change expert with NC Sea Grant) as they show and discuss a collection of movie clips that are frightening, fantastic, funny and far-fetched, and answer your questions. This event is being organized and sponsored by Science Communicators of North Carolina (SCONC) and the Duke Initiative for Science & Society, and hosted by the North Carolina Museum of Natural Sciences. It is being offered as an official event of the North Carolina Science Festival. What is the current state of biomedical HIV prevention and HIV in Africa? What role does society play in supporting or not supporting young African women’s ability to take action to reduce their HIV risk? Join us for a discussion! Science & Society will also provide a shuttle for those unable to arrange transportation to the dinner dialogue location. Shuttles will depart 30 minutes before the scheduled event from the front entrance of the North Building on West Campus (304 Research Dr.). Click here for a map. 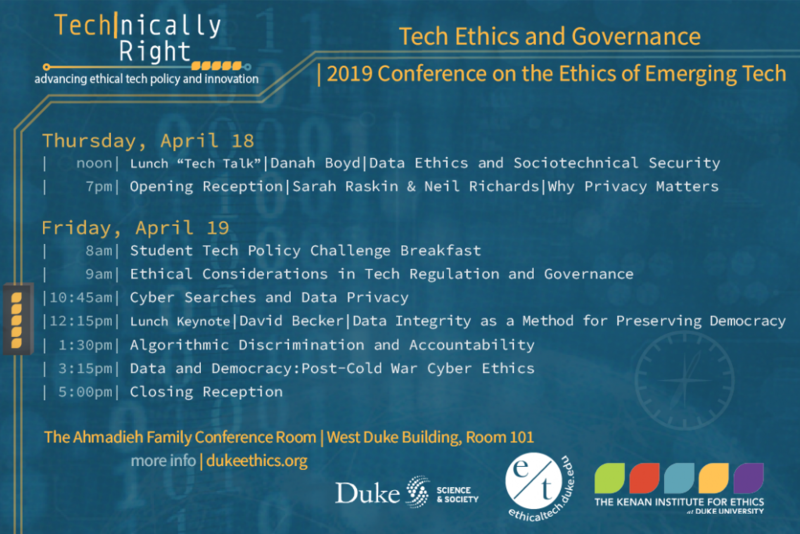 We invite potential students and advisors to learn more about the Duke Master in Bioethics & Science Policy from Associate Director Madeline Liddicoat. This interactive session offers insights about our unique curriculum and student experience. Participants should leave with a better understanding of whether the Duke MA in Bioethics & Science Policy is a fit for them. 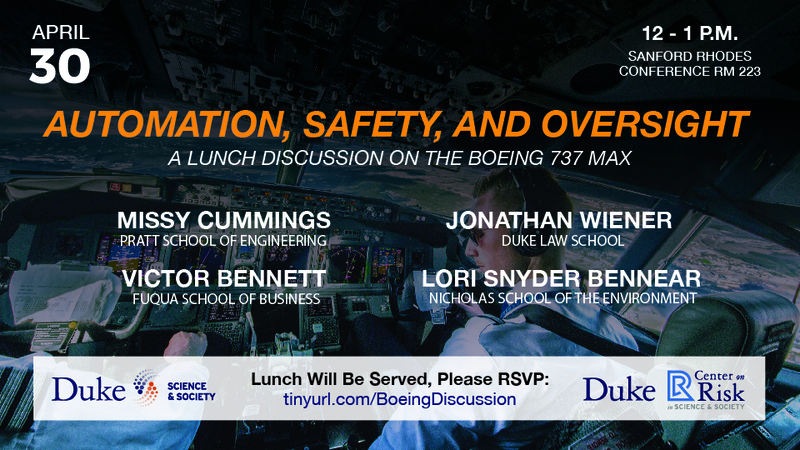 The panel will be discussing the roles of automation, business strategy, and regulatory oversight in the recent Boeing 737 Max tragedies. Subscribe to the Science & Society calendar! If you have a Mac and/or Outlook, click here. Google Calendar Users: Click the arrow next to “other calendars”. Select “add by URL”. Enter the following link: http://scienceandsociety.duke.edu/ics_calendar_feed.ics. Click “add calendar”. Outlook Users: After you click on the link above, click to launch the application. If you are prompted for an application, click “outlook”. The calendar will be added to your list of Outlook calendars. Mac Users: After you click on the link above, click “subscribe”. Enter “Science & Society calendar” in the name field.